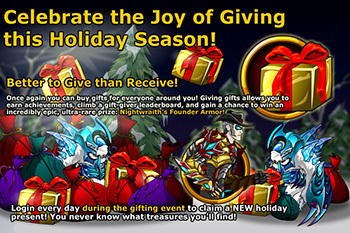 Winter is coming and that means the return of EpicDuel's most anticipated event of the year: Gifting! Until then, you can stock up on returning seasonal rares available at Torgan and Edgar Boothe in Frysteland! 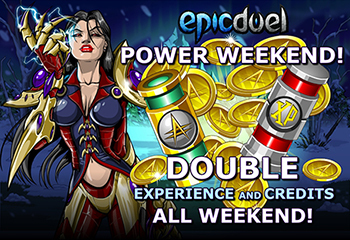 Since this is an extended weekend, we're offering an extended Power Weekend! That means starting midnight tonight, you'll earn Double XP and Credits until Monday! You'll need all the credits you can get for what's to come! As mentioned before, our annual gifting event is just around the corner, NEXT WEEK, in fact! 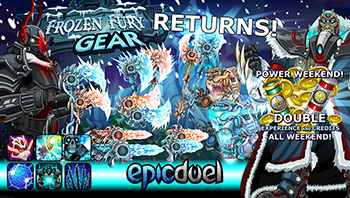 This time, the #1 prize will be Nightwraith's own personal Founder Armor! The top placing players will receive the new Platinum Yeti morphs! Based on your feedback in the forums, we're including many more features, adjustments, and balance improvements that should shift some of the game's fundamentals for the better (hopefully!). Obviously, we can't incorporate every suggestion -- we don't have the time, resources, or engine flexibility to include them all -- but we can do our best to improve the longevity and fun-factor of the game as we head into 2017! Many prominent players have remarked that one of EpicDuel's biggest problems in the early game is that it just takes too dang long to level up! We agree, so we're adjusting the leveling curve to allow players to reach the cap much faster (up to 3x faster) than before. This feature request goes waaaaay back to the initial release of factions. With this feature, faction founders will be able to promote another faction member to become the new founder. The founder will be demoted to whatever status the promote player was. This feature has a multi-step confirmation process so it shouldn't be possible to "slip" and put a rando in charge of your prestigious faction. We will be introducing cores from promos past (excluding development phase items) as unbound cores. This means you will be able to buy and attach cores like Platinum's pride to any weapon you desire. We're doing this to give you some of the flexibilty and customization we promised at the start of Omega. We've adjusted many of the skills and cores in the game based on your suggestions. Because testing is still underway, we won't list the numbers here just yet. We will likely do another balance pass after the Gifting event goes live and more battle feedback can be gathered. Matching in these modes has been a pain for awhile now, but we're testing some solutions to improve this situation. Juggernauts will receive a buff similar to Underdog which will scale with their opponents. 2v2 partners can also receive a modified Underdog buff that's been customized for this mode. Development is ongoing and we'll cram as many features and items as we can in what time we have. We though about doing a promotional package, but realized that introducing several new cores in the midst of all the other balance changes would probably not be the best idea. Expect a follow-up release after the initial Gifting launch for fixes, adjustments, and a few features that didn't quite make the initial cut. Happy Thanksgiving and Duel On!